Angry Bird’s “overnight success” only took 8 years. On March 10 the creators of Angry Birds (Rovio studios) announced that they had taken $42 Million in funding. They currently hold the record for the best selling iOS game ever. There is talks of a movie being produced featuring Angry Birds. You can already buy stuffed animal versions of the birds. I overheard someone dismissively talk about how Rovio had everything handed to them and that’s why they had “overnight success”. I almost went medieval on them. There is no denying that Angry Birds is a culture phenomenon, but one thing it’s not is an “overnight success”. Did you know that the guys at Rovio spent 8 YEARS working on other games before they finally caught a huge break? That takes dedication. For almost a decade they didn’t have any big wins. Sure they had some small to moderate success early on, but nothing massive. Heck when Angry Birds came out on the iOS app store sales were pretty slow for the first 3 months. 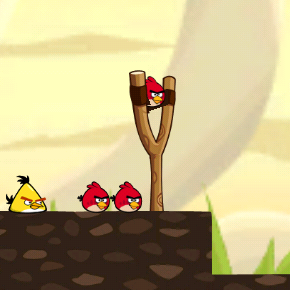 The Rovio guys believed in their product and kept their nose to the grindstone. Through an iterative process they were able to grow Angry Birds into the massive success that it is today. “Over night success” is often idolized in the startup world, but sometimes the glamor is based in myth rather than reality. Show up and work hard each and every day and remember that you’re getting closer. You can’t have a breakout hit if you never show up. For more startup news, please follow us on Twitter @startupfoundry. Previous Previous post: Talk to your real customers, not your imaginary ones. The SyncPad story.